Monday, January 14th, 2013. 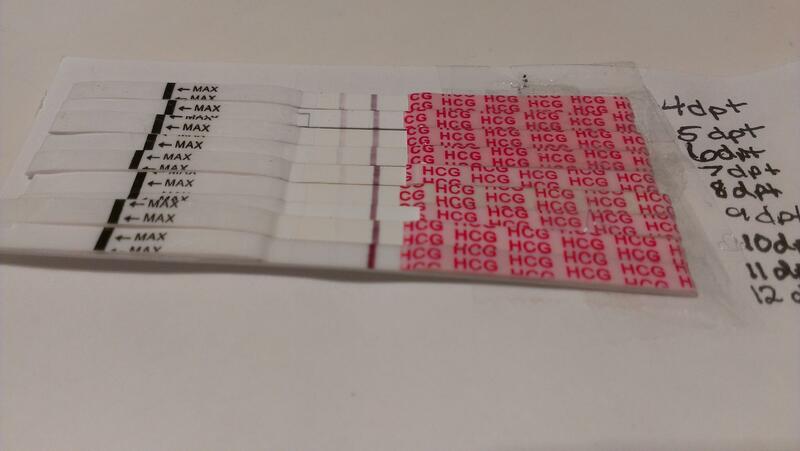 CD24, 10DPO. I’ve been having some crazy dreams the past few nights, and last night was no exception. I tossed and turned with some of the vivid situations playing out in my head, and then I just woke up. From that point on, I think I just hovered on the edge of sleep and waking, and little wisps of sad dreams floated by until my alarm went off. The “dream” I was having just before I woke for good was not a happy one. I was basically flipping through images of all of my friends and family, counting how many children they had all brought into the world since the husband and I started trying for a baby of our own in March of 2009. Couples have met, dated, gotten engaged, married, honeymooned and then procreated in that amount of time. We’ve just been stuck, stagnant, trying in vain for what seems so far away. I try not to wallow, but when you’re dreaming, you’re a captive to your subconscious. I woke up on that sad, bitter note, and I’m finding it difficult to trudge my way up out of the funk. On a somewhat lighter note, I have continued to test out the Ovidrel trigger over the weekend, and can report that this morning’s test was so barely-there that I’m calling it a BFN. Sunday, August 12th, 2012. 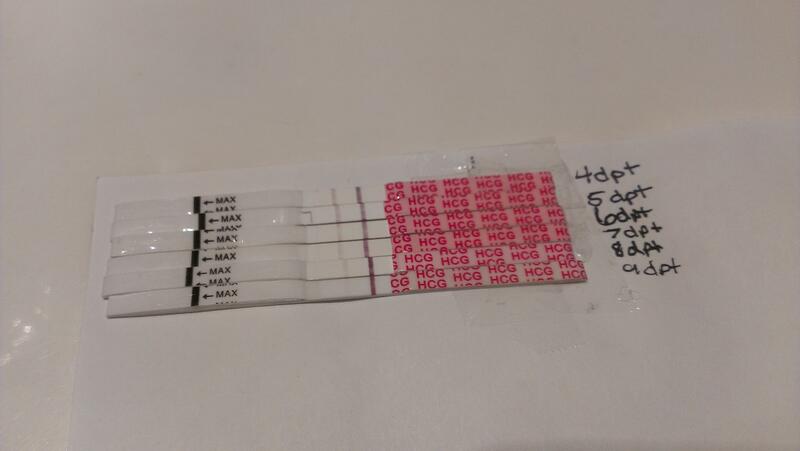 CD27, 9DPO. My chart is pretty this month. See that? I have pretty consistent temps in the luteal phase, a nice could-be implantation dip at the perfect time, a lovely fallback rise, and if my temps stay elevated, FertilityFriend will likely suggest that I’m triphasic. 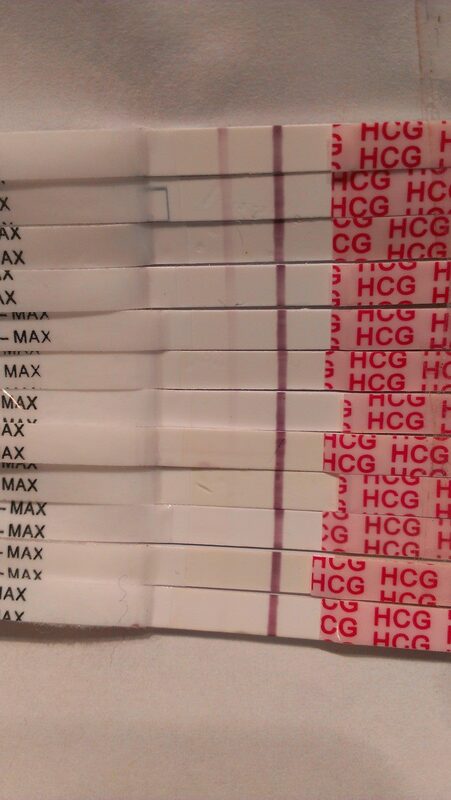 Do charts this pretty ever yield a BFP?? So anyway, that’s my rant for the day. I hope you all are having a lovely Sunday, friends! Friday, August 10th, 2012. 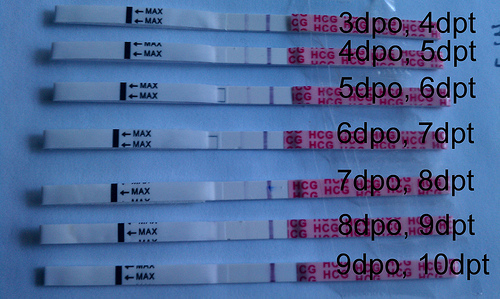 CD25, 7DPO. Just like every single two week wait in existence, I have reached the point of crazy. I am having constant conversations with myself trying to rationalize symptoms that may be caused by a whole heap of things not at all related to pregnancy, and yet I still find myself hopeful. That is, until I remember that I’ve been hopeful before. And I was wrong then. Very wrong. Either way, things are happening. This cycle is uncharted territory and I have no idea what to expect. Nausea – I haven’t exactly tossed my cookies, but for the past 24 hours I have been feeling icky. Kinda like this empty pit in my stomach that food and drink can’t touch sort of feeling. Bleh. Strange Temps – my BBT chart is all sorts of weird this cycle. Four straight days of flat temps, followed by a slight rise, and then today it dipped below the coverline. Ummm… What the French, toast? Sore Lady Lumps – my boobies feel like hot needles are poking into them. For reals. Don’t poke them, don’t squeeze them, don’t even look at them. 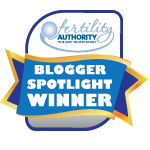 They hurt that much, although heightened progesterone seems to do that to me in every medicated cycle. 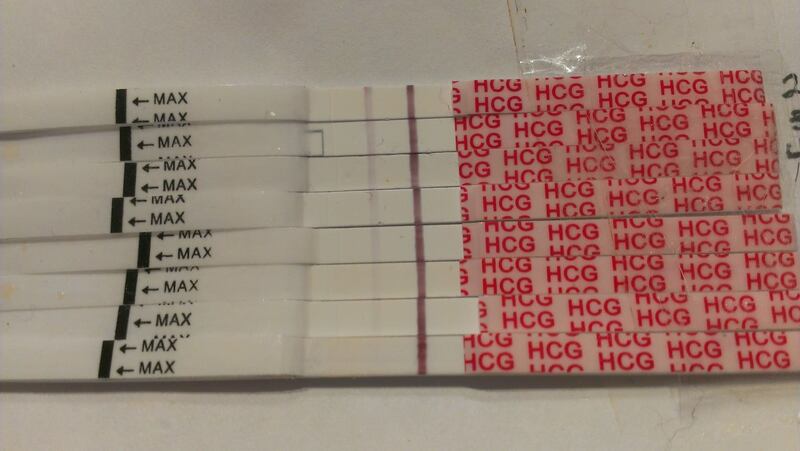 HPT Progression – I’ve been testing out the trigger as usual, but I’ve never done so with an Ovidrel trigger before. I expected it to vacate my system sooner, but it’s sticking around. 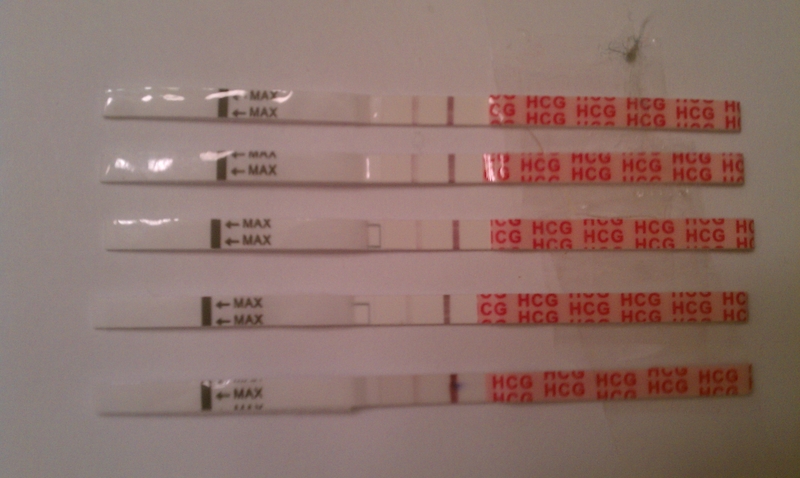 And check out that last test, which was from this morning… Is it just me, or does it maybe look darker than yesterday’s? And so, you can clearly see that I am crazy. I can’t help obsessing. I’ve tried to curb it in the past, but the way I operate best seems to be balls-to-the-wall. Feel everything completely, let go of the control, and let it all happen.